Literary Lady, Dr. Patricia Daly-Lipe, is an Author, Artist and Speaker. Patricia has written five books Messages from Nature, (a collection of short stories about animals, the high seas, and nature); A CRUEL CALM, Paris Between the Wars (a historical fiction); Myth, Magic and Metaphor, A Journey into the Heart of Creativity; ALL ALONE, Washington to Rome, A '60s Memoir; and La Jolla, A Celebration of Its Past. The La Jolla book published by SunBelt Publications, was the Winner of the San Diego Books Awards in 2002. A Cruel Calm (1st edition: Forbidden Loves) won the 1st Runner-Up for Fiction JADA Trophy and the USABookNews.com Finalist Award. Patricia is the past President of the National League of American Pen Women-La Jolla Branch, and the recipient of the 2004 Woman of Achievement Award from the NLAPW-La Jolla. She was also President of the Washington, DC Branch of NLAPW. In 2007, Patricia was speaker for the National Capital District 36 Toastmasters 2007 Spring Conference. Her presentation was titled 'The Power of Words'. In 2010, Patricia was recognized as a VIP in the Cambridge Who's Who. Patricia has written for the Evening Star Newspaper in Washington, the Beach and Bay Press including La Jolla Village News in California, and The Georgetowner and Uptowner Newspapers in Washington as well as several magazines across the country. Her presentations have covered all aspects of writing for literary groups as well as colleges and universities. In her "spare" time, Patriciahas been rescuing thoroughbred horses. In the late '70s and '80s, she raised and raced them. 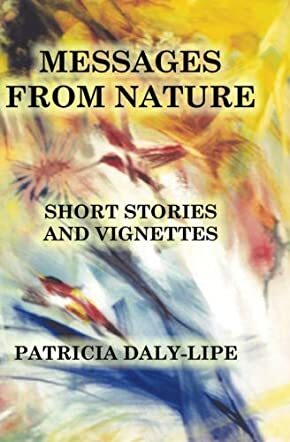 In her book “Messages from Nature,” Patricia Daly-Lipe gives her readers a collection of interesting short stories about many areas of the journey of life. She also includes a really nice tale written by her late father, which to me was a great honor to read. In this book, you will find stories about animals and the lessons we learn from them as their tale unfolds; about Adventures in the world of waters wild; ahe evolutionary journey with man and nature; and the last section is 'Poetic Meditations' the author has given her readers. I especially enjoyed the first section of this book with the animal stories. I was saddened by the story of Shawnara, the adorable mare that didn’t live, but what a precious animal to love! And my favorite was Woodstock, a small furry pup found on a farm in Virginia and which would have been killed had it not been for his rescue. Woodstock found his calling at being a sailor and loved the sea and sailing. This is just a taste of what you will read in this wonderful book by Patricia Daly-Lipe. Patricia has a wonderful way with story-telling that will draw you into the stories in a special way. You can almost feel being right there in the story with her characters. This is a wonderful fun, interesting and a really good book to read and enjoy. And if you are not a person to read long stories, well this is the book for you. The stories are short, easily read in one setting, and when you have time for another read, another great story will be waiting for you. Why not grab a copy of “Messages From Nature” to read and enjoy for yourself?